Emilie took her best ever placement in a world cup in China Sunday with her 4th place in the sprint. Nothing to be done with winner Kirsten Wild (Giant Shimano). The team was very active during the race, Sara took the ‘queen of mountain’ sprint on the bridge to Shanghai. Tone was in a solo break and was caught in the final kilometers. In the sprint Lauren commanded the team and did a great leadout for Emilers 4th, we even got Cecilie on 10th and Julie on 12th place. This was enough to win the team competition. 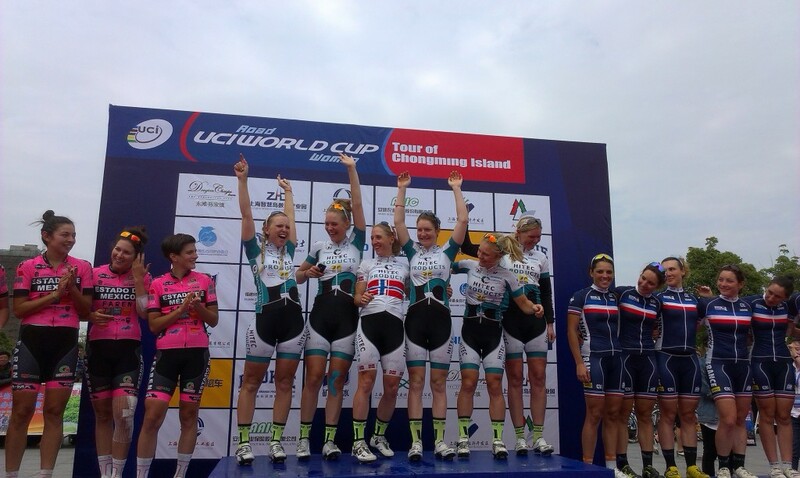 We are now 3d in the UCI World Cup ranking for teams.